Contact Aqua Boy Powerwashing today for your next cleaning project. Call, email, or use the convenient form below to get your free quote. We’ll respond quickly to get you on your way! 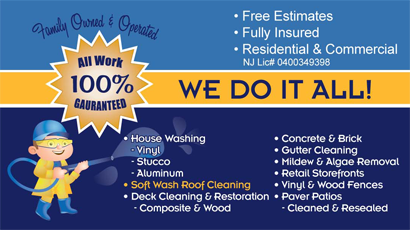 Aqua Boy Power Washing primarily serves the Southern New Jersey, Philadelphia & Delaware tri-state area. We proudly service the communities listed below. If you don’t see your area, please contact us for confirmation.